Airports can be quite tricky for families. They often suggest you arrive hours ahead of your departure, require you to stand in long lines during security checks, and make things like breastfeeding more challenging. One of the most stressful aspects of travel for parents is how they’ll keep their children entertained. Here are the top 10 kid-friendly airports in the U.S. that have got you covered, or at least until your plane takes off! Top 10 Most Kid-Friendly Airports in the U.S. 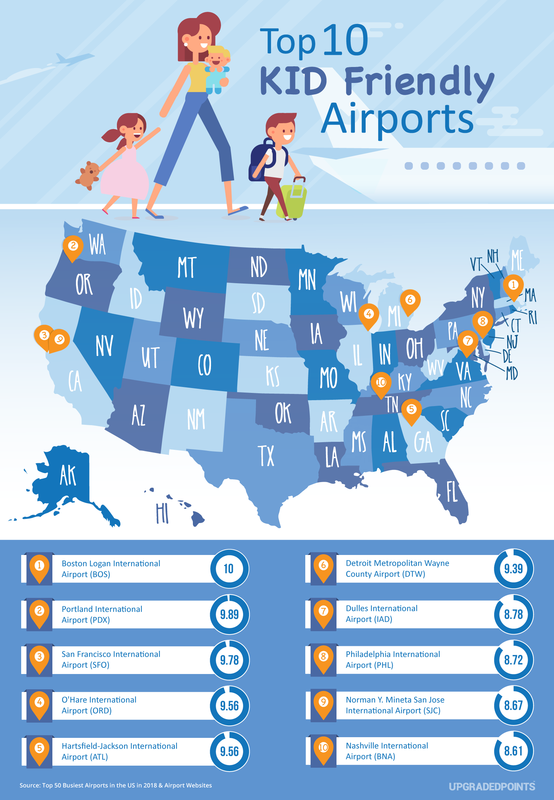 The Least Kid-Friendly Airports in the U.S. This study looked at the U.S.’s 50 busiest airports by total passenger boardings in 2018 to conduct our study given these would be the airports you are most likely to visit during your travels. Since there are no guidelines or regulations when it comes to being kid-friendly, the amenities offered by airports vary wildly. To calculate these rankings, points were awarded based on the quality and number of kid-friendly activities offered at each airport. Airports with multiple play areas received a maximum of 4.5 points based on quality and number of these designated areas. For other kid-friendly activities such as scavenger hunts, art exhibits, tours, and live music, a maximum of 3.5 points were awarded. Unlimited free access to Wi-Fi was awarded a maximum of 1 point since Wi-Fi can keep your teens occupied for hours and some airports also have a dedicated website with activities specifically for kids. Lastly, lounges can be a welcome break from a hectic airport for all travelers, but especially families! A maximum of 1 point was given for airports with multiple lounge options. For this reason, no additional points were awarded for complying with this federal regulation. While the range of what space is offered varies from pods to more luxurious accommodations, know that you will no longer have to sit on a toilet seat to pump or walk to a different terminal to feed your child in privacy. A great resource to check the location of and specific amenities provided by these nursing areas is the airport’s website or the airport guides from Sleeping in Airports. These 10 airports feature premier indoor playgrounds, art installations, and a number of fun activities that’ll keep your kids happy. You might just have to pull your kids away from the action to catch your flight! Boston Logan offers “Kidsport” play areas in 3 terminals. These areas were designed by the Children’s Museum of Boston. The indoor playground features a baggage claim slide, a climbable airplane, a replica built of the airport’s control tower, and slides. All play areas are stationed close to bathrooms for those much needed potty breaks. For those with babies, you’ll find rocking chairs peppered throughout the airport. Free Wi-Fi and charging stations are available throughout the airport. Portland International Airport earns top marks for everything from terminal facilities, accessibility, food options, and entertainment. So it shouldn’t come as a surprise that this airport also offers great amenities for kids. Multiple play areas are located pre-security in front of Concourses D and E. These play areas include small climbing structures plus a toy telescope to watch planes out on the tarmac. Post-security, there are a few play area in the Terminals C and D. Here, Lego tables and sculpted foam play elements will keep your kids occupied before your flight or during a layover. Perhaps the most unique feature is the Hollywood Theatre, a cinema located in Concourse C, that features short, family-friendly films by local filmmakers. Kids’ Spots are located post-security in all terminals and feature unique, interactive displays. Terminal 3’s Kids’ Spot features an offshoot of San Francisco’s Exploratorium. This is a weather-themed play area features crawling equipment and the “Plasma Wall”, which is a display of colorful arcs that jump around when activated by sound. Terminal 2’s kid’s area features original artwork by Bay Area artists that operate as interactive learning and play stations. The Kids’ Spot in Terminal 1 evokes a playful forest with tons of soft carpet for the woodland floor and trees to play among. Also, kids can take several terminal tours to receive a small gift at the end. Also, if you’re lucky, you’ll get to meet a member of the “Wag Brigade,” where SFO brings trained dogs to the terminals. Members of the Wag Brigade love to be petted and are there specifically to make travel more enjoyable. “Kids on the Fly” is an exhibit in Terminal 2 where children can crawl around and inspect an airplane, a control tower, and a helicopter model. There are also legos for them to enjoy! In Terminal 1, kids can also see a 72-foot long Brachiosaurus model, a 744-foot long kinetic neon sculpture of light and sound, as well as a replica of the WWII fighter plane. If you need a dose of nature, check out the world’s first airport aeroponic garden between Terminals 2 and 3. This garden contains more than 1,000 plants and sustainability tips. Atlanta’s Hartsfield-Jackson airport is the busiest airport in the world, and also one of the coolest airports for kids to visit. There are two play areas with slides for young children who need to get out some energy before take off. Check out the art program featuring a 20-piece Zimbabwean stone sculpture and compositions by local youth ranging in age from kindergarten to 12th grade. In addition to these areas, the Atlanta airport features a fully assembled skeleton of Yangchuanosaurus, which is a dinosaur that lived in China during the Jurassic period. At Detroit’s airport, be sure to check out the 39-foot wide water feature that was inspired by the lines of a flight map. Drop a coin and make a wish as the money collected goes toward local and national non-profit organizations. Located in the middle of all the concourses, is a 700-foot tunnel lit by 9,000 feet of LED lighting. This attraction is popular, pretty accessible, and can be a good choice for those kids who love all things glowing, moving, and mesmerizing. Complimentary Wi-Fi is also available across the airport. Hot Tip: The water feature at DTW was designed by the same creators as the Bellagio Hotel fountains in Las Vegas. Concourse B is home to a kids’ play area that was developed by NASA. Interactive games, slides, and aviation-themed play are all available. Parents can also enjoy comfortable seats and charging stations. The airport offers special events throughout the year, along with live arts performances, including a classical music month for November! Wings for All is a free program that best benefits special needs families with simulated flights. Families can practice navigating the terminal, checking bags, going through security, and boarding. Just Plane Fun is PHL’s summer entertainment program that features tons of activities for kids to enjoy including video gaming, caricaturists, and story time with local authors. During the holidays, PHL also has a calendar of events that brings local musicians and entertainers to stages throughout the airport. Ready For Takeoff in Terminal A-East features a jumbo jet, along with a control tower, and tug. Children can pretend to be pilots, passengers, drivers, or air traffic controllers! San Jose airport has a KidPort, which is a free airport play area designed for children that also allows them to learn something about aviation. Children can listen on the phone connected to live communications between the control tower and pilots. Another phone enables kids at the airport to talk to children at the San Jose Children’s Discovery Museum in downtown San Jose. Lastly, San Jose Airport’s acclaimed Art + Technology Program now offers an audio tour, featuring the artists themselves! If you’re at the airport at the right time, you’ll be lucky enough to catch live musical performances on one of the airport’s four stages. While bands of all different genres play year round, Thursday and Friday afternoons are the best times to catch a show. BNA keeps an up-to-date schedule of all the bands playing. The airport also has an extensive public art program, including permanent installations and rotating exhibits. For kids with the kind of energy that can’t be burned off enjoying art and music, the airport also features 3 play areas – one in each terminal. These areas feature legos, tunnels, slides, and climbing walls. While Tampa’s airport doesn’t have any designated play areas for kids, they do have another unique feature of a 1,500-gallon aquarium stocked with clownfish, tangs, and wrasses. Kids will be sure to love this along with daily scavenger hunts offered at the airport. SEA has a 1,400-square foot play area that is aviation-themed. All play equipment made of soft foam and contains a landing airplane, control tower, baggage cart, and smiling ladybug all ready to be climbed and explored. There are also padded walls exhibits mounted that feature educational games. MSP has two children play areas with a mock airplane, control tower, slides, and electrical outlets near an adult seating area. Additionally, a 1.4-mile walking path was developed in Terminal 1, so there’s a good place for your kids to run off their energy before boarding. There is not much to do or see at the San Juan airport. There are a few lounges that have TV rooms and kids’ play areas, but if you don’t have access, you’ll be out of luck. There’s not even free Wi-Fi to keep your teens occupied. Although one of the busiest airports in the country, Honolulu International Airport (HNL) does not offer any play areas, art, or education programs for kids. There is an outdoor garden that you can catch some sun at though. At least there is free Wi-Fi. Fort Myers has a few art exhibits located throughout the airport, but not much else that can really be deemed “kid-friendly”. Unless your kids like hanging out in the gift shop, we suggest bringing your own form of entertainment along with you. There are some art exhibits and musical performances to be found around Hobby Airport, but no specific considerations were made for the kiddos. Definitely be sure to bring your own tools to keep your kids busy before your flight. The Mother’s Room here is particularly nice as there is a wall-mounted TV in the room. In addition, a number of cafés and restaurants offer a fantastic window of the airfield. However, there are no play areas or other activities to keep your kids occupied here. Now that you know the airports that are the most enjoyable to travel through with a child, it’s time to get traveling with them! At a high level, here are a few tips to make the trip easy for all members of the family. There’s also a complete guide for flying with children if you want a more in-depth look. Although children under 2 years old do not need their own seat, still be sure to contact your airline to inform them that they will be traveling with you. While a boarding pass is not required for infants, your airline may still require you to have a boarding verification document. Proof of age may also be required. Make sure you bring lots of snacks onboard. Pulling out a container with your child’s favorite treats can be a great option if you sense a meltdown coming on. Crayons, markers, pencil crayons, etc. Hot Tip: While all domestic carriers allow FAA-approved seats in the cabin, international carriers have their own rules. Some carriers don’t allow car seats at all so it’s a great idea to check ahead of time. Most airports have a TSA Family Lane to help parents, flying with children, get through security. Be on the lookout for these marked lanes. In addition, children under 12 years-of-age can leave on their shoes and light jackets when going through screening. Liquid and gel rules do apply to snacks. However, frozen liquid items are allowed through security as long as they are frozen solid; so freeze any liquids prior to security. Juice boxes serve as excellent icepacks pre-security and melt into your child’s favorite drink post-security. Hot Tip: TSA allows formula, breast milk, and juice in reasonable quantities in carry-on bags. Normal liquid and gel rules do not apply. 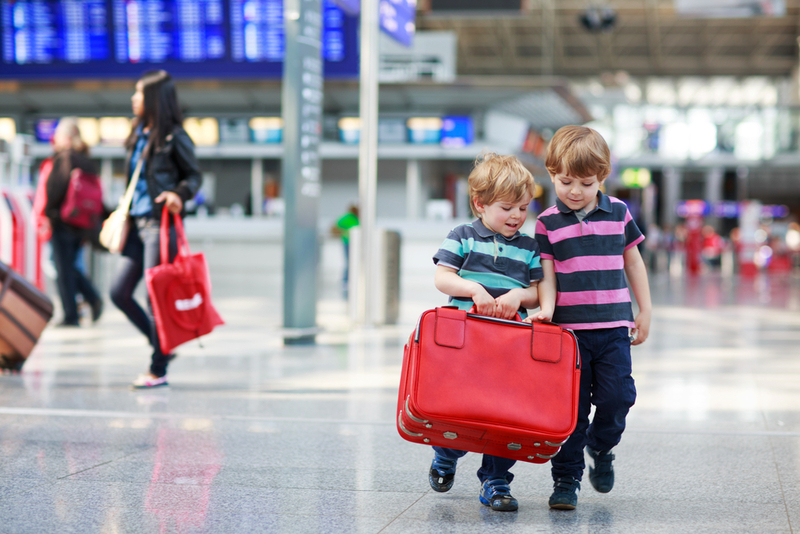 If you are lucky enough to travel through one of the Top 10 Kid-Friendly Airports, you and your kids may even enjoy the time you spend at the airport before your flight or during your layover. Otherwise, you may need to get creative. Try walking around stores or finding good viewpoints of the planes taking off and landing. Make sure you check in at the ticket counter if you want to pre-board and get a tag for your strollers. Don’t worry; it will be there when you deplane. Take advantage of any priority or early boarding opportunities. It can give you and your family a few crucial extra minutes to get situated before everyone else boards. Put all of those snacks and entertainment devices to use! Don’t put too much stress on yourself to abide by normal schedules or routines. Hot Tip: Our Ultimate Guide to Less Stressful Flights with Kids is full of fantastic ways to plan and prepare for your next journey. Some airports in the U.S. really care about making your whole family’s flight experience more tolerable and maybe even enjoyable! At the end of the day, a happy and tired kid can make the experience better for everyone on board.